Declan Brassil & Co. is Planning Consultant on the development phases for the Heuston South Quarter development in Dublin 8. 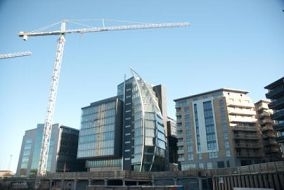 The city centre site has an overall area of 3.2 ha. Located at a strategic entry point to the city centre along St John’s Road West opposite Heuston Station, the project is being developed as a landmark rejuvenation scheme creating a new business, living and cultural quarter for the city. The site is located adjacent to the historic Royal Hospital Kilmainham providing conservation sensitivity but equally opportunities for linkages and synergy between the two zones. The current phase of the project involves co-ordination of pre-planning, modifications to original planning and compliance phases for the development. The scheme includes 340 residential units and approximately 40,000 sq.m .of commercial space including office and retail uses. The scheme is high density in character with building heights of 12 to 16 storey on permitted landmark elements. The scheme includes office, residential, retail, hotel use, museum and cultural events centre, bars, restaurants and a central public plaza. A team of Irish and international architects and landscape designers including Anthony Reddy Associates, Jan Gehl Architecture, MAKE Architects and Michael Cullinane Architects are co-ordinating closely with the Council to provide a development of international standard.